Yes, America Deserves Much Beto Than O'Rourke. You are here: Home / Money / Business / Yes, America Deserves Much Beto Than O’Rourke. Yes, America Deserves Much Beto Than O’Rourke. (ThyBlackMan.com) Watching Beto O’Rourke announce his candidacy for president, I had snake oil salesman come to mind. Everything about this guy is fake, which makes him a perfect candidate for fake news media to celebrate. For example: While claiming to be pro-second amendment, great deceiver O’Rouke voted against every piece of pro-gun legislation that came to his desk. https://bit.ly/2T9sjvB To deceive voters into believing he is a regular guy, millionaire O’Rourke posted video of himself in a laundromat doing laundry. https://bit.ly/2O86hZ9O’Rourke came disturbingly close to scamming Texans into electing him over Ted Cruz. Our Economy: Trump has our economy booming. Black unemployment is the lowest in recorded history. https://bit.ly/2F8JhoT Hispanics and women are also doing great in Trump’s economy. Our Climate: For the ga-zillionth time, man-made climate change is a proven hoax.https://bit.ly/2uanzM6 O’Rourke passionately warns that not embracing the Green New Deal will lead to the extinction of the human race in a decade or so. Here’s a reminder of the insanity in the Green New Deal. By 2030 we must end air travel; end the use of fossil fuels; mandate that every new job be unionized; decommission every nuclear plant; rebuild every building in America for state-of-the-art energy efficiency and government funding everyone including deadbeats who refuse to work. 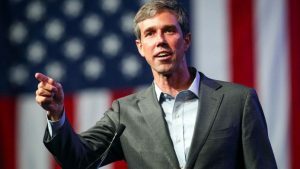 As a black American, I was stunned when O’Rourke said we should “confront the hard truths of slavery, and segregation, and suppression in these United States of America.” What the heck is he talking about? Ratification of the Thirteenth Amendment in 1865 ended slavery in America. The only segregation I am aware of is black students segregating themselves on college campuses; demanding black student unions and race-based housing facilities. https://bit.ly/2Y1B6mL Who are the masses of Americans O’Rourke claims we are suppressing? Do you see O’Rourke using Democrats’ disgusting tactic of dividing Americans into bogus victimized voting blocs?